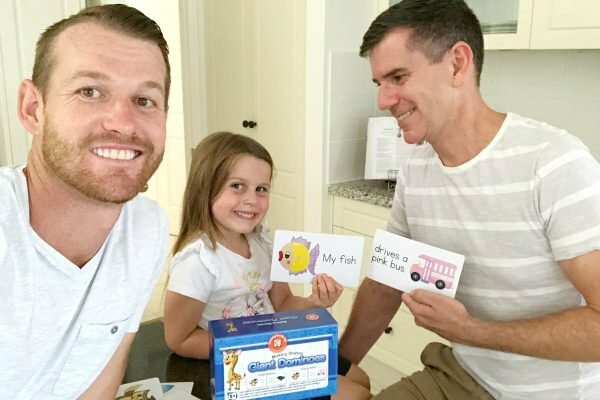 Educational games, books and toys for kids in Australia: A dad's review. When our daughter Olivia started prep early this year, we were so excited to see her begin her educational adventure. What we probably didn’t quite realise is just how involved we would be as parents, almost becoming part-time teachers ourselves. Life as a parent is busy and most of us struggle with work, family and life in general. But dedicating that extra one-on-one learning time with your kids is important – and to be honest, it can be really fun too. As busy as we are, we need to find the time, however little it might be. In our house, we like to bring a sense of play to Olivia’s learning – and that often takes having the right tools. We have been exploring Officeworks’ Learn and Grow range, an affordable and diverse collection of learning tools that fit into the spare time we have, giving us no excuses. 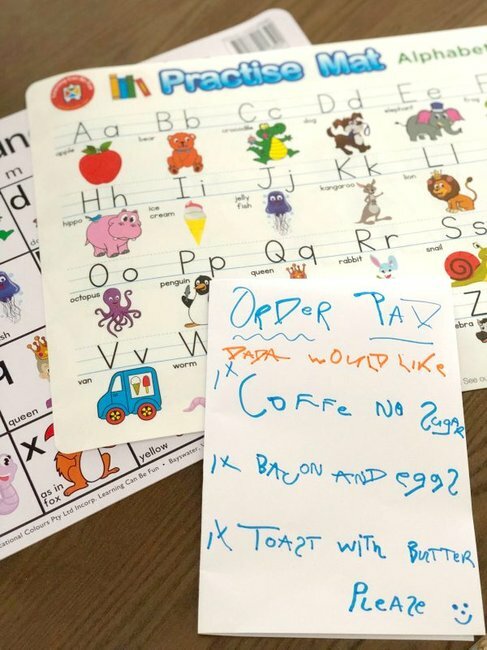 One of our daughters’ favourite activities to play shops – in particular, running her own cafe which includes her multitasking as chef, waitress and cleaner! To help her set up shop, we used the Sounds Are Fun placemat and Practise Mat Alphabet, which were perfect to help her sound out the words she wanted to use on her menu for the cafe. The mats have cute, colourful pictures and the alphabet mat has a section on the back to trace over and practice their letters with it easily being wiped clean for next time. They’re perfect for her development right now. The cafe is open! Holt and Olivia with the Single Sounds Are Fun placemat ($11.98). And what cafe would be in operation without food, right? Well, Olivia like any kid loves playing with playdough and so the non-toxic Kadink dough is perfect. This super-soft stuff is exclusive to Officeworks, and there are lots of fun colours for creating her specialty dishes. I think the fluro-coloured bacon and eggs with a pink latte was my favourite! Of course with all this fun and learning we can’t forget that the cafe still has bills to pay! 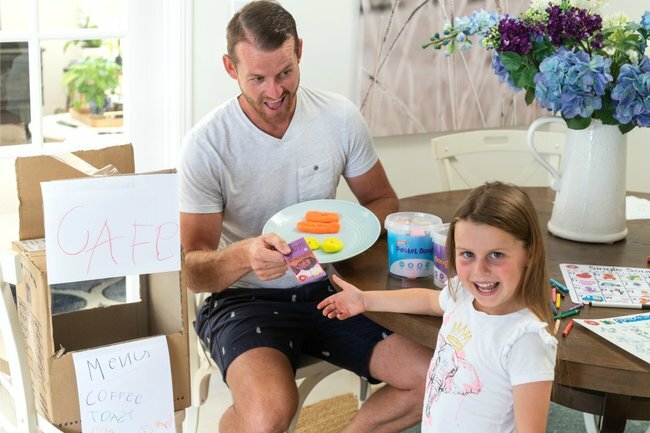 Officeworks&apos; Learning Can Be Fun range has a play money wallet which has real-looking Australian money and cute little credit cards. Not only is she learning to count, add and subtract in her play cafe, but she got to practise little sentences when taking my order too, making sure that my coffee came with no sugar. Important stuff, right? Bacon and eggs, anyone? 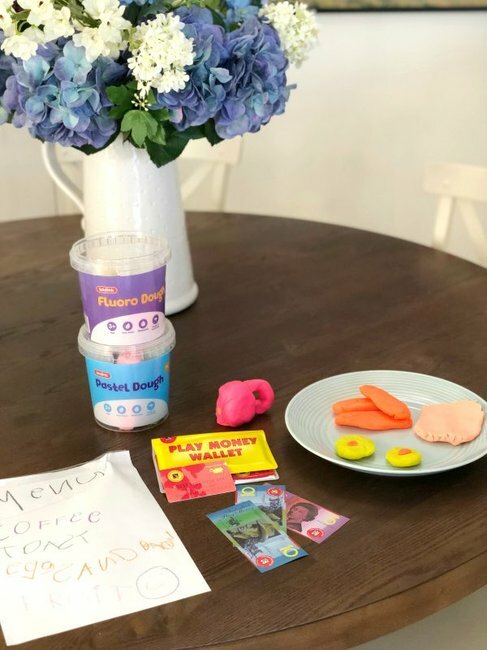 Kadink fluro playdough ($7.48), Kadink pastel playdough ($7.48) and the play money wallet ($20.97). Lucky for me, Olivia&apos;s cafe was very affordable with my bacon, eggs and coffee only costing $5 but poor Holt, on the other hand, had to pull out the play credit card as his avocado on toast was a steep $46 AND 77 cents exactly. Where does she think we are... the Versace hotel? Once the cafe is closed, we still have time to fill (usually on weekends because what kid doesn’t like to wake at 5am right??... right?). We pull out our Making Stories giant dominoes. Each sentence has a picture with the proper ending but also a funny version too, like "The fireman has a red vest", but Olivia changed it to "The fireman drives a pink bus" (of course he does). With the possibility of over 400 sentences to be made I think we are well on our way to filling in the morning and making it to 8am to start the rest of our day. Story time: Me, Olivia and Holt with our Making Stories giant dominoes ($19.97). We can&apos;t play shop all day, as much as Olivia wants to. But we can do any of the above in little bits whenever there&apos;s a spare moment. Sometimes we have 20 minutes in the morning to write menus, and after school, we continue on with the rest of the activities or play more on the weekends. As parents, we are so proud to watch our daughter grow and develop, making sure to always find the time to be there right next to her along the way. 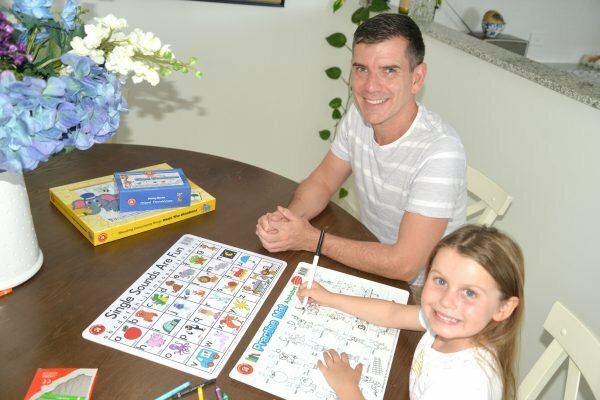 See, learning can be fun and not just for Olivia - but her dads too! For more inspiration, check out Officeworks&apos; full Learn and Grow range. What&apos;s your favourite learning tool for your child? Tips welcome below!